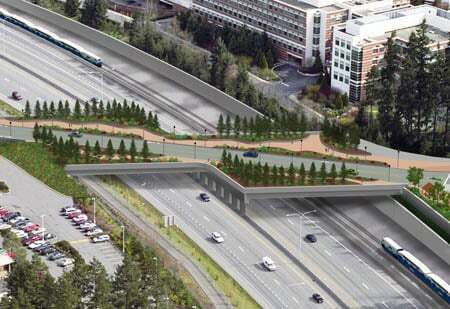 Microsoft is running into a buzzsaw of bad PR over $11m (£7.7m) in US economic-stimulus funds that Washington state officials have earmarked for a bridge over a highway that would connect two branches of its Redmond intergalactic nerve center. Supporters of the payout contend that the $36.5m (£25.4m) project - for which Microsoft is pitching in $17.5m (£12.2m) - will benefit more than one company. CNN quotes Redmond's mayor, John Marchione, as saying "We're not a one-company town. Our traffic studies show that Microsoft traffic would be about 42 percent of the bridge, yet Microsoft is paying for about 50 percent of the bridge, so we think we are getting fair value." Others are less generous. Steve Ellis, vice president of Taxpayers for Common Sense - the watchdog group that named Alaska's infamous "Bridge to Nowhere" - remarked that "I’m sure Steve Ballmer or Bill Gates could finance this out of pocket change. Subsidizing an overpass to one of the richest companies in the country certainly isn’t going to be the best use of our precious dollars." Whether Microsoft's bigwigs carry $11m in their pockets is unlikely, but it's certain that the grant is small potatoes when compared to the $787bn (£548.7bn) allocated to US projects by the Obama administration's stimulus package - a mere 0.0014-per-cent spud, to be exact. Ellis isn't convinced. "This is really about getting while the getting is good," he said. "Uncle Sam has a big wallet that's there for the taking, and Redmond wanted to take it - and Microsoft was happy to let them pick up that part of the tab." Microsoft's general counsel, Brad Smith, however, is understandably upbeat about the stimulus funds. "We think this is a very positive example of a public-private partnership," he said, "and we are pleased to be contributing roughly 50 per cent of the funding to help build this public project that will benefit the entire community." Marchione also noted that the project would "create just under 400 jobs for 18 months constructing the bridge. It's also connecting our technical sector with our retail and commercial sectors so people can cross the freeway to shop and help traffic flow." On the project's discussion page on StimulusWatch, voters are trending against the bridge. At this writing, 42 per cent say that the project qualifies as "critical" and 58 per cent disagree. Voters' comments range from "The complaints about the project are just silly" to "Let Microsoft pay for it since it connects their campus!" Open Internet lovin' Comcast: Buy our TV service – or no faster broadband for you!